With Samsung releasing the Galaxy S7 and Galaxy S7 Edge running Marshmallow, each phone gets to take advantage of the new emoji that arrived as a part of the Android 6.0.1 update. That means that Samsung had to create new emoji that represents all of those new to Android items, because Samsung doesn’t just use Google’s version of emoji, they like to express each through their own take. And that, of course, means we get some weird versions. In general, the new emoji include a lion head, unicorn, chipmunk, turkey, taco, burrito, popcorn, middle finger hand, and upside down smiley. It’s most of what you thought you were going to get. But because this is Samsung, stuff like this happens to the eye-roll face. Is that a sideways looking smirk? I don’t know…how…that…represents an eye-roll. Samsung also didn’t include any of the flags, so your country pride is forever diminished while on your S7 or S7 Edge. But the weirdest of all, is the fact that they skipped out on emoji modifiers for diverse skin tones and just made everyone white…except for the police officer and dancer, who are black. OK, then! Below is a video of the emoji. You’ll find the full details at the source link. 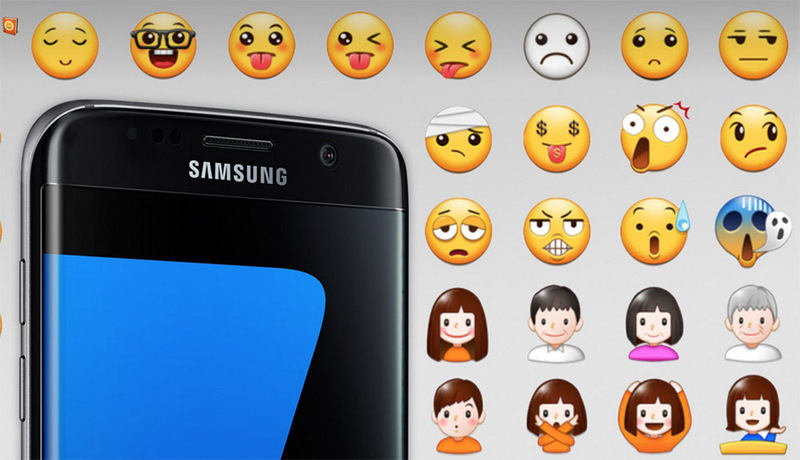 Also, these emoji will come to the rest of Samsung’s phone that receive Android 6.0.1.